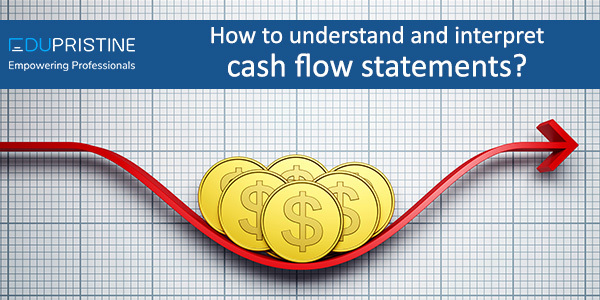 EduPristine>Blog>How to understand and interpret cash flow statement? A cash flow statement is essential to any business as it can be the basis of budgeting by assessing the timing and fixing the future cash flows. The statement of cash flow like other two key. A financial statement is a collection of reports presenting inflows and outflows of cash in forms of receipt and payment. This involves various activities of business including operating, investing and financing during a specific period. A cash flow statement finds out the inward and outward flow of money in a business and therefore acts as a bridge between the income statement and balance sheet. The change in cash per period, as well as the beginning and ending balances of cash, are present in a cash flow statement. While summarizing the amount of cash and cash equivalents flowing in and out of the company, also measures to manage company’s cash position. Operating activities reflects the amount of cash generated from products and services of a company and includes the primary revenue producing activities of the business. The direct presentation is a simple but rarely used method which presents operating cash flows simply as a list of cash flows. On the other hand, an Indirect method is widely used and hence a common presentation of operating cash flows as a reconciliation from profit to cash flow. Under the indirect method, amortization, deferred tax, depreciation, revenue received from investing activities and profit or loss associated with a noncurrent asset are included. The acquisition and disposal of non-current assets and any other sources of cash from a company’s investments are included in investing activities. Typically, investing cash flows include the cash flow associated with buying and selling the property, marketable securities and therefore cash changes from investing are ‘cash out’ items. For example, lending money is considered an investing activity. Borrowing and repaying the money, issuing stock and paying dividends are some of the financing activities. These activities result in changes in the size of equity capital and borrowings of the entity. This is applied to convert the accrual basis income statement into a cash flow statement. The statement of cash flow follows activity format and includes, operating cash flows, investing cash flows and financing cash flows. There are two methods to control the cash flow statement. For both the methods, investing cash flows and financing cash flows remain identical. The operating section of the statement can be produced through either direct or indirect method. The direct method shows the major classes of gross cash receipts and gross cash payments. On the other hand, the direct method follows net income and adjustment of profit/loss by the effect of the transaction. The underlying accounting ideas remain the same. Hence, working cash flows provide identical result under the direct or indirect method of preparing the cash flow statement. The difference lies in the presentation. Although the direct method is set by IASB, for providing useful information; more than 90% of companies use the indirect method. The direct and indirect method are two forms of producing a statement of cash flows. The direct method involves tallying all instances of received and paid cash and the total represents the resulting cash flow. However, in the indirect method, the accounting line items are used to show cash flow. Cash flow statements show both positive and negative cash flow. While positive cash flows are healthy, negative cash flow should not raise a red flag automatically. Further analysis of cash flows over various periods enables an investor to assess a company’s performance. An analysis of cash flow statements can reveal many things like the quality of earnings through comparison of cash from operating activities to company’s net income. For example, earnings are said to be higher if cash from operating activities is higher than net income. The statement of cash flow is a significant measure of profitability and present and future outlook for a company. It decides the strength of a company and provides data whether a company has enough cash to pay its expenses or not.